Updated 9:48 p.m. | Ahead of Thursday night’s “body-slamming” incident, most bets were on Republican nominee Greg Gianforte, who’s led by single digits in recent public and private polling, winning Montana’s at-large House seat on Thursday. But that’d still be a dramatic shift from President Donald Trump’s 20-point victory in the state last fall. “It’s going to be close, but we’ll see who shows up at the polls,” Montana Democratic Sen. Jon Tester said earlier this week. Republicans are thankful colleges are out for the summer. But they have to hope their base turns out on the Thursday before Memorial Day to support a previously unsuccessful statewide candidate who started this race with high negatives. Thursday’s news drew some unflattering headlines. Gianforte was accused of assaulting a reporter at a campaign event in Bozeman, sparking strong criticism on the eve of the special election. GOP outside groups have spent millions of dollars propping up Gianforte and attacking Democratic nominee Rob Quist, while Quist has tapped into similar donor enthusiasm seen in Georgia to raise $6 million in just a few months. That spending has been more than enough to put the Montana race in the national spotlight. Meanwhile, both parties are trying to manage expectations here, while preparing for the year’s main electoral showdown in Georgia next month. Both Quist and Gianforte have argued they’re the better fit to represent the at-large seat. That authenticity argument came to a head early in the race in dueling TV ads in which the candidates shoot screens to show off their commitment to Second Amendment rights. “Montanans go down the ballot irrespective of party identification and just vote for who they believe best represents Montana,” said Sen. Steve Daines, the state’s Republican senator. Quist is a first-time candidate; Gianforte is a failed gubernatorial candidate. Six months ago, he earned 46 percent of the vote, losing to Democratic Gov. Steve Bullock. Trump won nearly 57 percent of the vote. “That’s hard to do,” said a Republican strategist familiar with the race. And the early attacks on Gianforte in the special election contest weren’t much different from last year’s. “As soon as Greg started getting attacked on TV, people were like, ‘Oh, yeah, that guy, [the] billionaire jerk from New Jersey,’” the strategist said. Quist, on the other hand, began this race largely unknown outside of his musical career in the Mission Mountain Wood Band. But both candidates have money problems — Gianforte has too much of it; Quist has a history of debt and unpaid taxes. The Congressional Leadership Fund, the super PAC backed by House GOP leadership, has been the biggest spender in this race, dropping about $2.7 million. They’ve been on offense against Quist since the day after he secured the Democratic nod — and before Republicans even had a nominee of their own. Republicans, led by the fund, have hammered Quist for his personal financial troubles, trying to paint a picture of an irresponsible big spender. They’ve tied him to House Minority Leader Nancy Pelosi and argued that support from Vermont Sen. Bernie Sanders, who campaigned with Quist over the weekend, makes him “too liberal” for Montana. Democrats have tried to spin Quist’s financial struggles, arguing that those tough times have allowed him to better understand the lives of everyday Montanans. Quist has said his financial troubles stemmed from medical complications from surgery, and he’s used that talking point to tap into the liberal fury over the GOP health care bill. Revelations that Gianforte said he was “thankful” for the bill on a private conference call proved a fundraising boon for Quist. While Donald Trump Jr. and Vice President Mike Pence have campaigned for Gianforte, the race has been less about Trump, given that he won the state easily. Instead, Quist has kept up the pressure on health care, using it to try to reinforce the image of Gianforte as a self-serving rich guy. Democrats have gone after him for self-funding his gubernatorial campaign and for cutting last-minutes checks to his House campaign, too. In a debate, Quist also attacked Gianforte for having financial ties to Russian companies on the U.S. sanctions list. If this race is close, some Democrats have asked, why hasn’t the national party spent more money here? National Democrats took similar heat for not investing more in Kansas’ 4th District special election last month. 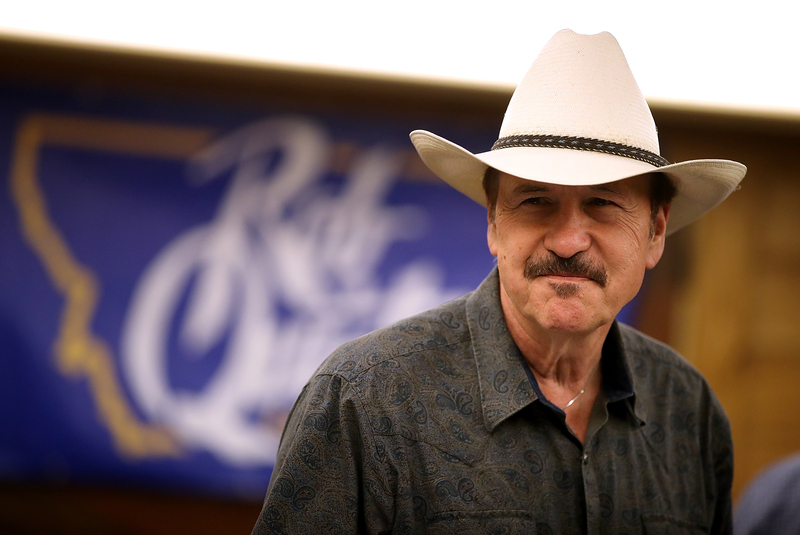 The Democratic Congressional Campaign Committee has spent about half a million dollars in Montana, funneling early money through the state party so that Quist could go up on TV, and later bolstering that with additional TV and mail efforts. But the overwhelming majority of outside spending in this race has been for Gianforte and against Quist. “Money is not what’s going to make Rob Quist win or lose this race,” a Democratic operative familiar with the state said. And Quist hasn’t suffered from lack of money. He received $1 million in just five days, his campaign announced this week. But the Democrats’ focus is clearly on Georgia, for which DCCC chairman Ben Ray Luján announced an additional $2 million in spending this week — the same day he acknowledged that “the data shows a tough path forward” in Montana. “You’re seeing investments made district to district that are smart investments, specific to those districts,” Luján said at a Tuesday press conference. Both parties acknowledge there’s little to be learned about the midterms from this Montana race and are carefully managing expectations. Republicans point to an unusual special election environment that’s allowed millions of dollars to flow to Quist. Democrats say this isn’t the kind of district they’re targeting in 2018. “At the end of the day, you win or lose. Nobody cares about anything else,” a Republican said, when asked about the implications of a narrow Quist loss. Tester agreed. “If he wins, it’s a victory. If he doesn’t win, it’s all for naught,” he said. But a Quist victory — and more likely, a narrow loss — could give way to speculation about what lies ahead for both parties, especially after Kansas’ 4th District saw a 20-point shift in partisan performance between last fall’s presidential results and this year’s special congressional election. “Republicans should be worried that they’ve had to dump so many dollars in to try to defend a district that they shouldn’t have had to spend a penny in,” Luján said. At the same time, some Democratic strategists are looking to quell pressure from their own base for candidates in red states to be more liberal. “One thing I’d be fearful of is that Quist ran as a progressive and therefore Democrats need Sanders candidates,” the Democratic operative said.“You have to be who you are,” he added.